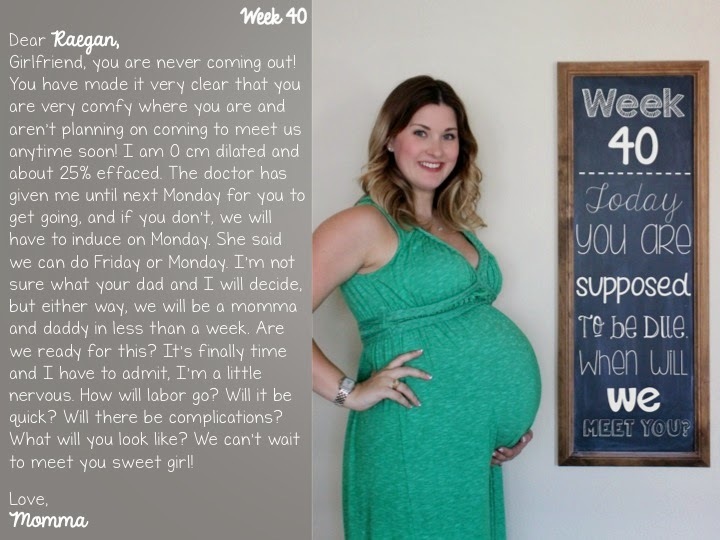 week 40- Raegan, your time is UP! - The Mrs. & Co. So I am leaving off the rest of the bump update because we are at the end! My due date was yesterday and our sweet girl is still as comfy as can be. My doctor checked me at my appointment and nothing has progressed. She also did a sono and Raegan is totally fine. My fluid levels are great and she is still as active as can be! So she's not showing any indication that she is in distress or needs to get out. And believe me, I have tried EVERYTHING to get her moving. I promise any idea you have, I've done it! My doctor wants to either induce Friday or Monday. I just don't know what to do. Our birth plan was to let her come when she's ready. I'm healthy, Raegan is healthy, and I would much rather let her come when she's ready, but it's looking like that may not happen. My doctor said Monday, July 28, is the absolute last day she would want to wait to induce. That just bugs me. We are both healthy. You say it's because Raegan could possibly be a big baby, but we don't know that for sure. I understand it's a gamble, but isn't that up to me? Ugh. I just don't know what to do. And EVERYONE has their own opinions of what we should do too. Which is totally fine. Everyone is entitled to their opinions, but then it kind of muddies the water and makes our decision harder to make. What is the right decision for us? Is there really a right or wrong decision when we get our baby in the end? Praying for peace and direction as we figure out what to do! I was just wandering this morning if you were at 40 weeks and here you are! I can't even imagine having to figure all of that out, I mean I have always felt go with your instinct but it sounds like they may not let you do that. Maybe just maybe that sweet girl will come before it gets to a point where you have to decide :) Praying for you and Raegan. You look fabulous at 40 weeks girl! Maybe she'll surprise you and come on her own before you are induced! :) Stay positive! You've got this! These two girls. Already stubborn aren't they?! :) My friend said it so well the other day: "scientists can figure out how to put a man on the moon but they can't predict child birth dates". Thinking of you! Hang in there! I do know that there is some risk of (I believe) placenta calcification if you wait too long, so that may be part of what you're doctor is talking about. Plus, the bigger the baby the worse you may tear and the more risk of his collar bone breaking as he delivers. That being said, I wouldn't want to be induced either. It's a tough one! Praying she comes before any induction is needed! Ill be keeping my fingers crossed that she just surprises you! Since I havent been pregnant (yes -- hopefully that changes soon! ), I am not sure what I would think/do. I figure if she's happily cooking inside your belly, might as well leave her. Haha! But I know that y'all are anxious to meet her. I pray that your delivery goes soooo smoothly!!!! Smile and nod at others opinions and do what you want anyway. Only you know what's best for you. Come on Rae!!! Get a move on! Makes me so sad to hear doctors who want to induce. Most of my friends have been to birthing centers - and they let you go 2 weeks after your due date. Follow the Lord's prompting (which sounds like you want her to come when HE has orchestrated it) - not when the doctor wants! Gah! You're getting so big, Ash. She's coming soon…I can feel it.